Atascocita Mobile Auto Repair, in Atascocita, TX. has been an ASE certified automotive technician for over 10 years. We have been working in Atascocita, TX since 2007 and has developed quite a following of repeat and referral business. We would love to earn your repeat business as well. So give us a call or contact us and see how nice it is to have a professional mechanic come to you. We typically do general repairs and maintenance in any safe location your car is broke down or parked. So if your car, truck, or van is broke down and needs to be repaired or you want to get a headlight replaced while you are at work. Atascocita Mobile Auto Repair will come to wherever your vehicle is, in the TX area, in order to repair it. How convenient would it be to get your brakes changed, oil changed, headlight replaced, or any routine maintenance all while you are at work for less than a car repair shop charges. We can show up and do a tune up or vehicle repair while you are at work. Our auto repair shop on wheels turns a parking lot or your garage or carport into our service garage. 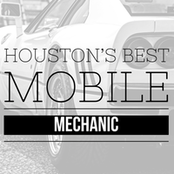 Atascocita Mobile Mechanic : 713-497-1202 Mobile Mechanic Atascocita, TX. ​Things to do while I work on your Car!